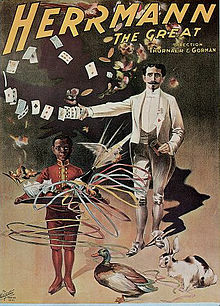 Alexander Herrmann (10 February 1844 – 17 December 1896), more famous as Herrmann the Great, was a French-born magician, who broke from tradition in his performance style, interweaving comedy with his magic. The very best illusions of the best magicians of a few years ago are now the common property of traveling showmen at country fairs. As quoted in Cosmopolitan (December 1892). That famous trick, related by nearly every writer on Hindu jugglery, of youths tossing balls of twine in the air and climbing up on them out of sight, I did not see, nor could I find during my visit any well-authenticated evidence that it was ever done. The tricks I saw I could have imitated with little preparation. I would not presume to introduce them upon the stage. This page was last edited on 13 March 2018, at 00:36.